A new training session called “Stop the Bleed” taught 150 Metrolinx employees how to stop uncontrolled bleeding in an emergency event on Monday. 'Stop the Bleed' was a response to mass shootings in the U.S.
A new training session called "Stop the Bleed" taught 150 Metrolinx employees how to stop uncontrolled bleeding in the case of an emergency event. 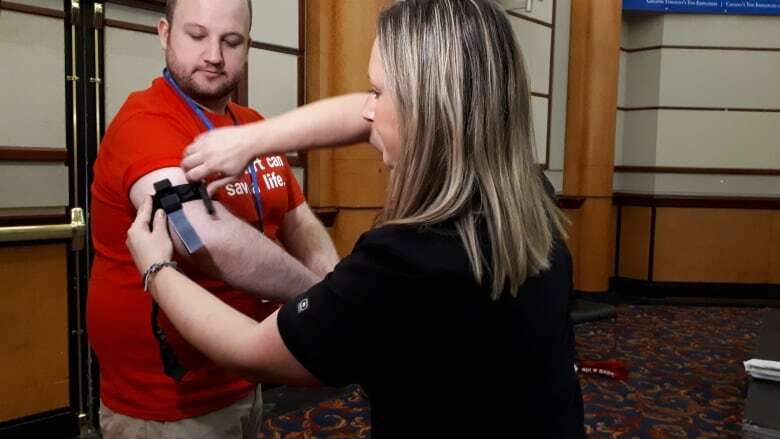 Monday's session was the first time the initiative — which was rolled out by Sunnybrook Health Sciences Centre trauma experts – was delivered to a large group in Ontario. Steve Harvey, a security manager of security for Metrolinx, says the course is a potentially life-saving investment for the organization's staff. "If there's an incident, they'll have some additional skills while paramedics are on their way," Harvey said. "We want to make sure we do everything we can to keep people safe in the case anything happens." Harvey says employees taking the course range from administrative staff, support, partner agencies and contractor staff. He said with thousands of people going through Union Station every day, it's important for all different types of staff to be prepared. "When you have a huge volume of people, it could be anything from an industrial accident or a motor-vehicle collision," Harvey said. "Now we will have a larger base of people who will be able to provide support if needed." Dr. Avery Nathens, surgeon-in-chief and medical director of trauma at Sunnybrook Health Sciences Centre, says the course was designed partially as a response to mass shootings in the United States. "This actually came out of the Sandy Hook Elementary shooting of 2012," Dr. Nathens said, referring to a mass shooting in which 20 schoolchildren were massacred by a heavily-armed man in Connecticut. Nathens says it's similar to how the general public learns and performs CPR, but not enough people know how to stop bleeding. "The focus of this course is empowering the public," Nathens said. "There's some very simple manoeuvres that can be used to make a difference and save a life." Nathens adds that a person can bleed to death within five to eight minutes, and those first few minutes are critical. "The most effective thing you can do is put direct pressure on that wound firmly with your fingers and hands, and if that doesn't work use a tourniquet." "Stop the Bleed" teaches proper bleeding control techniques, including how to use hands, dressings, and tourniquets. Anna Empey, an emergency management specialist with Metrolinx, says while she already has some training she learned a few new valuable skills. "I've never used a tourniquet or learned how to put one on," Empey said. "I also never realized you had to stuff in the gauze too." Empey says the course taught her how to deal with injuries on people of all sizes. "I have a four-year-old daughter, so learning these skills are valuable even for at home." 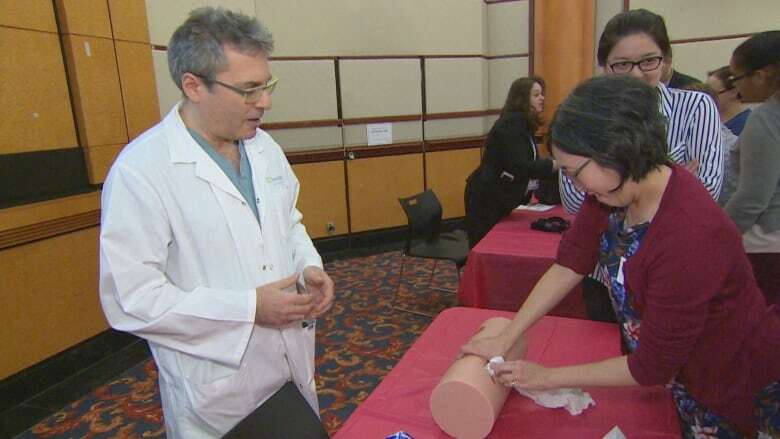 As of August this year, Sunnybrook began offering the training to the general public and staff who work in major public areas and at landmarks in the city.